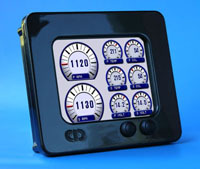 SeaGauge is a combination of multifunction color digital gauge panels and remote sensor units that replaces mechanical instruments and gauges in marine, boat, automotive, or RV applications. 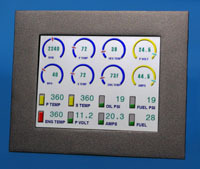 Now get digital instrumentation display of a variety of boat, automotive, or RV parameters such as TACHOMETER, RPM, OIL PRESSURE, ENGINE TEMPERATURE, Fuel Flow, FUEL LEVEL, VOLTMETER, MAIN and AUXILIARY BATTERY, and much more all in a compact sealed design. SeaGauge will work with a large variety of existing marine senders. Instrumentation layout and display labels are all programmable. Innovative sensor calibrations tables can be downloaded for just about any sender. Custom design it to fit your application. SeaGauge will replace existing instruments and gauges on most vessels without having to rewire or replace sensors. WiFi and Bluetooth network options allow multiple displays to be located up to 300 feet from the engine room without wires. Offer is an instant rebate off list price on direct purchase from web site. Mention code MSG0110109 and receive discount at time of purchase. Offer excludes accessories. Limited Offer valid till 11/30/2009. (c) Copyright 2009 Chetco Digital Inc.